Blob-like “Fatberg” removed from London sewer. 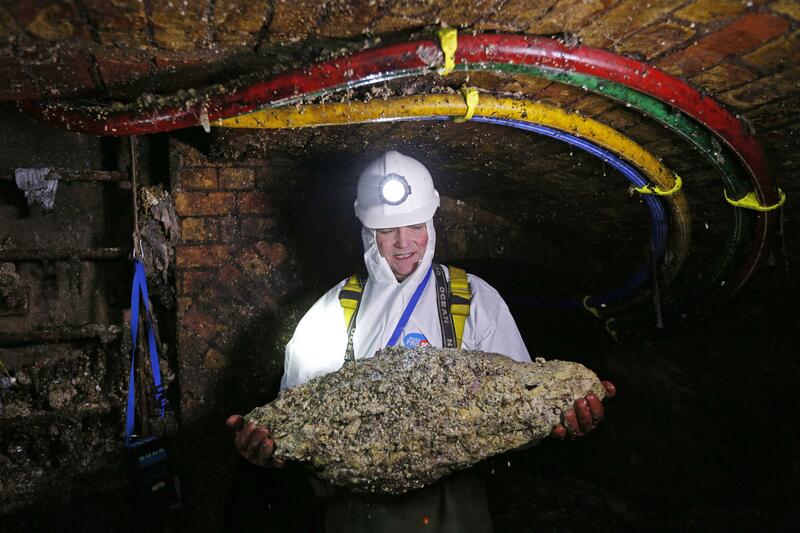 A sewer technician holds a ‘fatberg’ as he works in the London sewer in Dec. 2014. Most people don’t go mucking around in the sewer, but if you were asked what went on down there you would assume it wasn’t pretty. If you needed empirical evidence that falling down a manhole and getting trapped in the sewer was, in fact, nightmare-worthy, well, now you have it. In London, on Tuesday, a 10-ton mound of wet wipes and congealed fat, quasi-affectionately referred to as “fatberg,” was removed from the sewer system. The occurrence of “fatbergs” in the city is a growing problem. In fact, an even bigger blob struck the city less than two years ago. The mass is created by oil and fat discarded down the drain, which is a common occurrence in the highly populated capital city. The combustible ingredient fomenting the creation of Titanic-sized “fatbergs,” however, is a relatively silent assassin—the wet wipe. “The use of wet wipes as toilet paper is also increasing, exacerbating the situation,” the Guardian helpfully points out.